The Churchie Research Centre, which is located in The Centenary Library, seeks to enhance student learning by supporting the continual professional learning and development for our teachers. The centre will focus on the translation of current theory to evidence-based practice through sustained professional learning. The Churchie Research Centre will pursue partnerships that enhance the knowledge, practice and capabilities of Churchie’s teachers. Its central focus will be around applied educational research by translating current and emergent theory into practice while evaluating the subsequent impact on both teachers and students. This acknowledges the fundamental role that teachers play in affecting improved educational outcomes for all our students. The research centre will drive change through a range of support services for the Churchie and wider community through centralising, coordinating and enhancing the current research initiatives with the Swinburne University of Technology (emotional intelligence), the University of Melbourne (Innovative Learning Environments and Teacher Change) and The University of Queensland (Science for Learning Research Centre). Read more about Churchie's university partnerships here. Click here to subscribe to the Churchie Research Centre's termly newsletter. A survey of Years 7 to 11 students at Churchie on how each year level perceived their study behaviours and preferences. There are many more questions than answers about what works and why. What we do know is that one's context heavily influences learning; but what works in one setting/subject might not work in another. 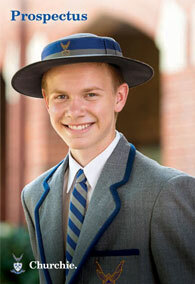 What, how and when do Churchie boys study? A three-year research project testing a hypothesis that the affordances of different digital devices affected pedagogies and student cognition and learning experiences. Does the consistent integration of self-regulation strategies, resilience coaching and digital feedback loops measurably improve the academic results of students in mathematics? Churchie is pleased to anounce the launch of the inaugural Churchie Research Centre newsletter. The longitudinal New Generation Learning Spaces (NGLS) project presents one of the first longitudinal empirical studies that evaluates the impact of secondary school learning spaces on teaching and learning. Is there a ‘sweet spot’ that connects a teacher with their learning environment? This year sees all our young men in the Senior School equipped with the latest tablet and stylus (digital pen) technology but what does this mean for teaching?